Although the English county of Westmorland no longer exists, this rural treat, also known as Tatie Pot and Lancashire Hotpot, is a welcome recipe from our neighbor's sheep country. 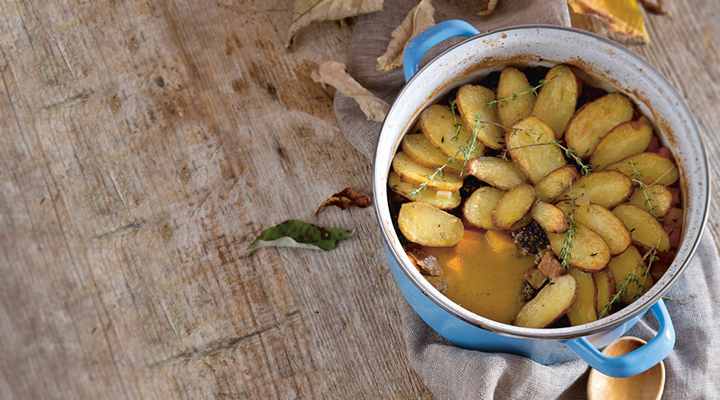 Traditionally made with mature lamb, Westmorland Hotpot is the perfect lamb dish for this time of year. 2. Remove any visible fat from the lamb. Heat the oil in an ovenproof casserole, then add the lamb to seal and brown it lightly. Add the black pudding, vegetables and stock, then layer the sliced potatoes on top. 3. Bring to a simmer, then bake in the oven, uncovered, for about 1½ hours, until the lamb is tender and the potatoes are beginning to brown. 4. To serve, ladle the hotpot into warmed bowls and garnish with some fresh thyme.